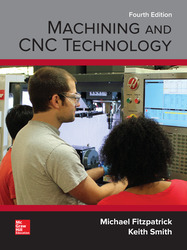 Machining and CNC Technology, Fourth Edition, by Michael Fitzpatrick, will provide the latest approach to machine tool technology available. Students will learn basic modern integrated manufacturing, CNC systems, CAD/CAM and advanced technologies, and how to safely set up and run both CNC and manually operated machines. This is a how-to-do-it text.